This PowerPoint presentation can be used in the classroom to introduce Night by Elie Wiesel. 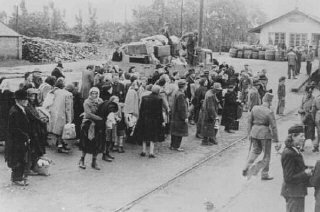 Students will learn about the experience of Hungarian Jews at the end of the war, as well as specific background information about Elie Wiesel. The presentation points out the unfortunate experience of the Hungarians, and illustrates how the war was fought against the Jews at the expense of losing the conflict against the Allies. When giving the presentation, the teacher can define and make clear to students the differences between the roles of perpetrator, bystander, victim and rescuer. This presentation was given at the Arkansas Holocaust Conference on Friday, November 14, 2003. The conference theme was "The Holocaust Remembered: Moral Bankruptcy" and also included addresses by Severin Hochberg, a historian at the United States Holocaust Memorial Museum and by Dr. Henry Friedlander, noted scholar, author and educator. The Holocaust Chronicle Destruction of Hungarian Jews. The International Raoul Wallenberg Foundation. Raoul Wallenberg biography. USHMM Holocaust Encyclopedia Hungary after the German occupation. USHMM Holocaust Encyclopedia Hungary before the German occupation. USHMM Holocaust Encyclopedia Raoul Wallenberg and the rescue of the Jews of Budapest.